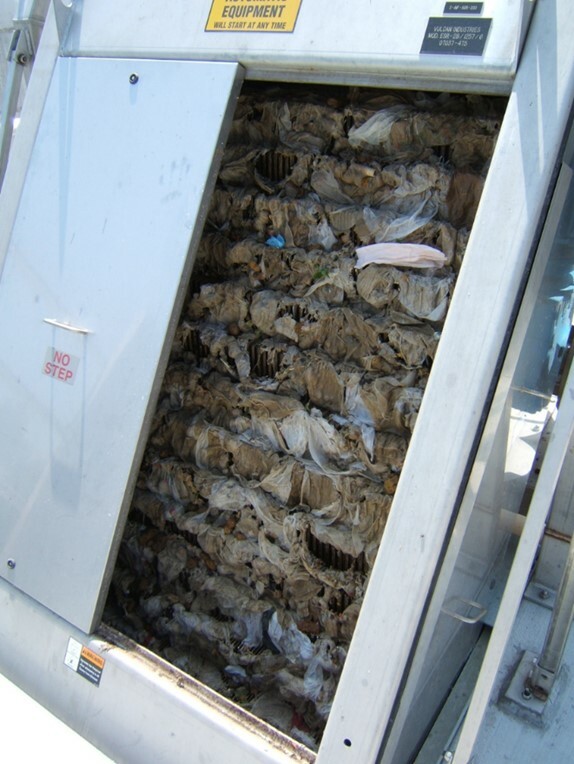 So you’ve chosen a stair screen for your fine screening application at your wastewater treatment plant. Excellent choice! Capture ratios up to 80% without the need of brushes, purge water, additional motors, etc. were all factors that weighed into the decision. Now the hard work of analyzing differences between specific stair screen manufacturers commences. The good news is that there are very few recognized manufactures of this specific equipment in the market place, so the analysis can really fall to two (2) leading manufacturers. To the naked eye, each manufacturer appears very similar in nature, but the differences in design philosophies are dramatic. 6 mm thick side frames in lieu of 4 mm frames. More material in the frames resist torque and torsion on the fame more efficiently. A more robust side frame promises better alignment of the lamellas and longer bearing and motor life. A superior chain driven system in lieu of a link driven system. Vulcan’s chain driven systems allows for no moving parts below the water surface and a positive engagement of the lamellas throughout the entire rotation of the lamella package. 0.5 mm gaps between the upper conveyance zone lamellas in lieu of “thickened” stainless steel lamellas. This design philosophy virtually eliminates screenings falling through the backside of the screen and back into the flow stream. Pictured below is a 6 mm stair screen with a 0.5 mm spacing conveyance lamella design. These are some of the reasons why Vulcan Industries has had the good fortune to have replaced several competitor installations the last couple of years. 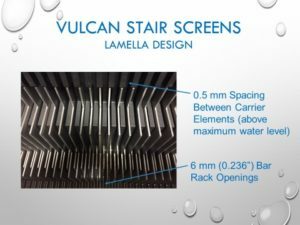 Coupled with our industry recognized “Best In Class” screenings washing press, a Vulcan Stair Screen could very well be the answer to your fine screening needs.